20 x 40 High Peak Frame Tents are designed for quick and easy setup and can hold up a large number guests for a cocktail party. Their size and elegant look make them ideal for outdoor events, such as weddings, rehearsal dinners, bridal parties, and baptisms. In addition to their aesthetic appeal, these high peak frame tents are popular because they have fewer fittings and parts than traditional a pole or frame tent. 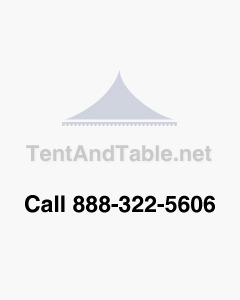 The tent tops are made our best quality waterproof 16-ounce commercial blockout vinyl material, which is mildew and mold resistant and has UV protection. Tent poles are constructed from 1/8" thick anodized schedule 40 aluminum. Anodized aluminum gives the pole more strength and helps it resist oxidization better than using raw aluminum. The frame is a heavy duty commercial frame and each pole measures about 2.5" in diameter. Tent legs are 9' 3" in length. This frame has no center pole. This 16-oz. blockout vinyl material is commercial grade.